As Michael Phelps slipped off his swim cap after anchoring the gold medal-winning men’s 4×200 freestyle relay, barber Raefus Cox smiled from his Atlanta home nearly 4,800 miles away. Thanks to the boys at #vintage barber shop for the nice trim before rio!!! Through the years we’ve learned a great deal about Phelps, the most decorated Olympic athlete since his debut in the 2000 games in Sydney. He’s the greatest swimmer in history and, entering Thursday, he has 21 gold medals, and 25 medals overall. Now we know that he likes to get hooked up at a black barbershop. We know this because Phelps’ selfie game is tight. Just over a week ago he took a shot with the staff and customers of Vintage The Barber Shop in downtown Atlanta and posted it on his Instagram page. Since the image went up, it has received more than 62,000 likes. Phelps is getting a lot of social media love from people impressed that he chose to get his cut at a place ranked by Yelp reviewers as the top black barbershop in Atlanta. Phelps found out about Vintage from one of his coaches, who had his hair cut there days earlier. When he entered the shop on July 29, he initially went unnoticed. There was nothing but love for Phelps, who spoke and answered questions from barbers and customers while taking pictures with everyone who asked. After getting what Phelps described as “a nice trim before Rio,” the five-time Olympian was nearly out the door when he pulled out his phone and asked everyone in the shop to gather around the chairs behind him. The fresh cut was seen around the world as Phelps carried the American flag into Maracana Stadium during the opening ceremony of the games last week, providing Cox with the highlight of his career. The Atlanta native has cut heads for nearly four years at Vintage, a popular Atlanta barbershop that’s been used for several movie shoots, including the 2014 film Selma. 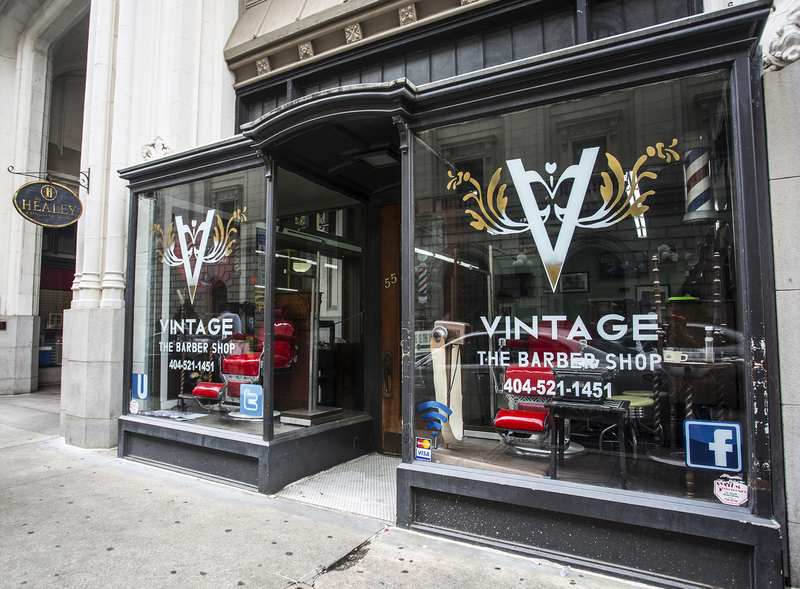 The exterior of Vintage the Barber Shop on Aug. 9 in Atlanta. Swimmer Michael Phelps of the United States stopped by the shop before departing for the 2016 Summer Olympics in Rio de Janeiro and posted a selfie on his Instagram. This week’s been crazy at Vintage. Cox’s phone has been blowing up with interview requests. It seems he’s trying to ride the wave: On Wednesday night, a company was working with Cox to put a watermark on a video that was shot of him cutting Phelps’ hair. Vintage, an already respected Atlanta barbershop, has only gotten more popular with the recent publicity. On Wednesday, a couple of swimmers from a team in Florida dropped by to get their hair cut. They found out about the shop on Instagram. Just call it the Phelps factor. The crew at Vintage is loving every moment of Phelps 2016, from his Dikembe Mutombo-like finger-wagging after winning the 200 butterfly last night to the Kobe Bryant-like fist bumps with his teammates in celebrating the relay win. And they love the fact that Phelps has given the shop some shine.